Liczba stron: 49 Jest to ujednolicona liczba stron, która ułatwi Ci porównanie długości książek. Każda strona Legimi to 200 słów. 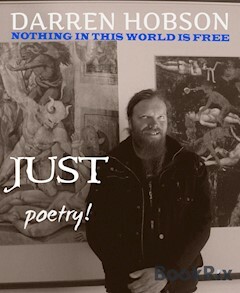 Nothing in this world is free, except poetry so come on aboard this free journey into this poets mind, he will introduce you to his poems that are carved from his memories and fantasies, every poem found in this free e-book is a preview of what can be found in his two paperback books. This is just a free taste to tingle your taste buds and have you begging for moreIs it only an optical illusion? this is why the pieces of the puzzle are shattered and the boundaries between the poetical world and that of hard-lined writers of classical romances are blurred, he teases you with tales of fantasy and stories of dancing cats, his wild imagination takes you on an adventure that never seems to end.This upcoming indie poet continues to surprise us with his imagination and depth of writing and has continued to write deep and darker over the last years, every struggle becomes a verse and every war becomes a poem. This collection of free poetry has been taken from the paperback books Poetry Tails and Just both written and published by Darren Hobson, each piece in this e-book is just the first verse from each poem in those books. If you like what you read then the next step would be to buy the paperback books. When these poems were written back in 2014 the poet was in a different place and a different mind frame as the years passed his poetry become stronger and bolder so what we read in these pages is sort of an end of an era, he wiped the slate clean and started on a different path, everything that was written after this e-book was written to be published in an ebook. This e-book was never meant to last this long on the digital shelves of the publishing universe but the e-book continues to be downloaded and so by public demand this digital freak is staying put. The paperback book Poetry Tails (ISBN13: 9781501054341) has one hundred pages and is a book full of poetry, the difference being that all the pieces are basically short stories but written in poetry, not the usual love poems then, just a little different from the daily poetry you see everywhere today, a lot of the poems are long and sometimes complicated, some are sad, some are crazy and yes the dancing cats appear! Now we focus on this stranger. The Orphan With The Torn Stockings. Not her style to ask for more. A Cheaper Way To Fly. It’s giving you a push and a cheaper way to fly.